The Cannon Cultural Museum Marly Berger Gallery & LoudMouth Press announce "Why Are You Surprised I'm Still Here? ", the sign collection of Billy Kaufman. Collection opening reception, Thursday July 14, 2011, 6:30 p.m. at The Arts Center of Cannon County. Reception free and open to the public. In July & August the Marly Berger Gallery will exhibit "Why are You Surprised I'm Still Here?" 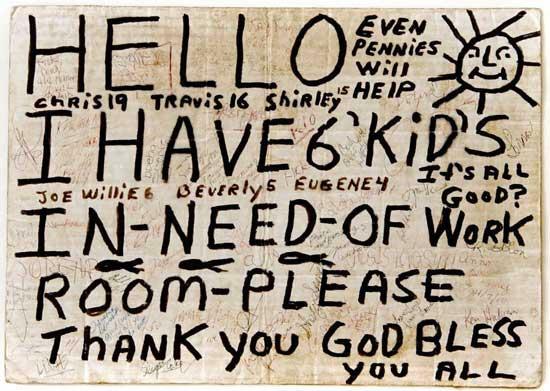 Billy Kaufman's collection of handmade signs on cardboard, used by the homeless community to convey need, express fears and strengths, and communicate their plight as the homeless in America. Over 60% of homeless citizens struggle with mental illness or addiction. Kaufman's collection sensitively reveals the travails of the homeless, sometimes spotlighting brief moments of joy and compassion. Combined with moving photographs and commentary, this unique show should not be missed. While on the street you can avert your attention away from these signs. Now you have a chance to review them up close, transforming details like language and texture into clues that tell previously hidden stories. The outcome is an opportunity for the viewer to remember our collective humanity and the potential to change the issues of homelessness that should not exist in the 21st Century. The LoudMouth Press published catalog of the collection will be available for signing at the reception. DO NOT miss out on this unique opportunity at the Marly Berger Gallery. LoudMouth Press is partnering with the National Coalition for the Homeless to give 100% of their net sales profits from Why Are You Surprised I’m Still Here? to the NCH. Admission to these exhibit is free and open to the public. The Marly Berger Gallery located in The Arts Center of Cannon County is open 10 a.m.-4:00 p.m. Monday through Saturday. 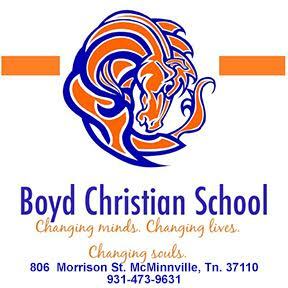 For more information pleased call 615-563-2787 or 1-800-235-9073. In the Marly Berger Gallery through August. The award winning Arts Center of Cannon County is a unique model for rural arts organizations. Situated in an underserved rural area in a town of 2,000 and a county of 12,000, The Arts Center annually commands a worldwide audience of 40,000 through its facility and over 100,000 through web sites, publications, and recording projects. Drawing on the blue-collar roots of its community, the organization focuses on self-sufficiency, fiscal responsibility and social entrepreneurship. LoudMouth Press is a non-profit independent publishing house founded in 2009 in Brooklyn, New York. We publish media that is: Non-fiction social commentary and observations, counter-cultural guides and practical manuals, global current events; photographic and illustrative cultural critiques, inventive art books, and more . . Homeless people in America face the obstacles of social invisibility — despite the fact that their condition puts them on display on our streets. "Why Are You Surprised I’m Still Here?" focuses on the nation’s homeless through a unique lens — the signs they make to communicate with the rest of us. Sometimes the sign is ironic, using humor to make a point; most often the sign is a cry for help and recognition. Color photographs catalog the cardboard signs of homeless panhandlers, which were gathered over almost a decade by Los Angeles-based artist-turned farmer, Billy Kaufman.